Two years after being crushed in a potentially career-ending motorcycle accident, British 800m champion Elliot Giles will don his first GB senior vest at the European Championships in Amsterdam, marking an astonishing comeback. The 22-year-old Birchfield Harrier was an emotional wreck in the immediate aftermath of winning his first senior national title, beating Jamie Webb and Michael Rimmer in a time of 1:48.00, as he reflected on a four-year journey which has been fraught with setbacks and physical turmoil. The gravity of Giles’ injury situation is evident in his Power of 10 record which shows a three-year absence of competition, stretching from January 2012 through to May 2015, but his return to form in 2016 brought seven wins in eight races through June, including a personal best of 1:47.21, and a first senior call-up to the European Championships next week. “I remember waking up the following day just in pain,” Giles told AW, recalling the accident which happened in Birmingham city centre in July 2014. The MRI scan detected no broken bones, but Giles was bed-ridden for three weeks with a severe haematoma over his back, brain damage, badly damaged posterior cruciate ligament, torn gluteal and heavily bruised lower back. Despite not achieving British Athletics’ improved qualification standard to compete in Amsterdam (1:46.50) Giles’ victory in Birmingham, coupled with the fact he’s run the lower standard required by European Athletics, earned him a discretionary pick by performance director Neil Black. 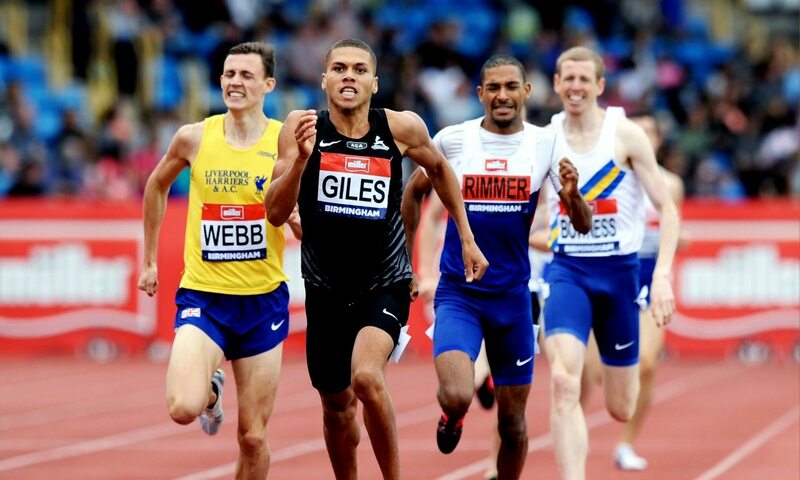 With high quality competition now confirmed on the horizon for Giles, who has been helped to recovery by James Brewer and Matt Yates – former and current coaches, respectively – the middle distance runner has the belief that the 1:46.00 required for Rio selection is a wholly achievable target. Giles said: “It’s about running a quick race now. I don’t necessarily need to hang on a guy’s shoulder. I just need to be in as lightly quicker race. Every race I’ve run quick in I’ve won. The last three races I’ve run around 1:47 I’ve won. PreviousMarathon training: The long run – how far?